Mussels are one of the things I miss the most about living on the east coast. Out east, they serve the freshest mussels EVERYWHERE! Each restaurant has their own twist on the broth or sauce, and one of my favourite broths of all time was a curry & cilantro combo that I had in the town where I went to university. I really miss fresh mussels, living on a coast means one is definitely spoiled when it comes to the quality of fresh seafood! Mussels are a classic French dish. Moules Mariniere, are mussels that are seasoned and cooked with white white, garlic, shallots, thyme and butter. Does it get any better? I am going to share with you a great recipe for making these mussels. These are great on their own as a main course with a warm crusty piece of French bread, or mixed in to some pasta for dinner. Mussels are a great dish to eat as they are cheap and quick - perfect for someone in a hurry! One thing about mussels - when you cook them, they should open up and create a V with their shells. If they remain closed do not eat them! 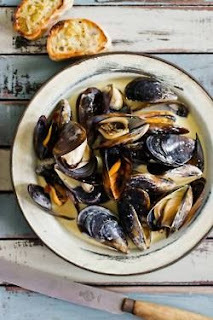 - In a saucepan that has a lid that will close and be able to fit over all of the mussels, add the butter and olive oil and sweat the garlic, shallots and thyme over medium heat until translucent.